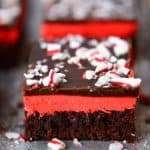 These Chocolate Peppermint Brownies have a fudgy chocolate brownie base and melt-in-your-mouth peppermint buttercream frosting topped with smooth chocolate mint icing and crushed candy canes. I partnered with The J.M. Smucker Company to create and share this recipe. It’s that combination of chocolate and mint that gets me every time! Brian and I even served chocolate mint brownies at our wedding in addition to a wedding cake. During much of the year we enjoy green mint desserts, but during the holidays it’s all about the red peppermint and candy cane versions. 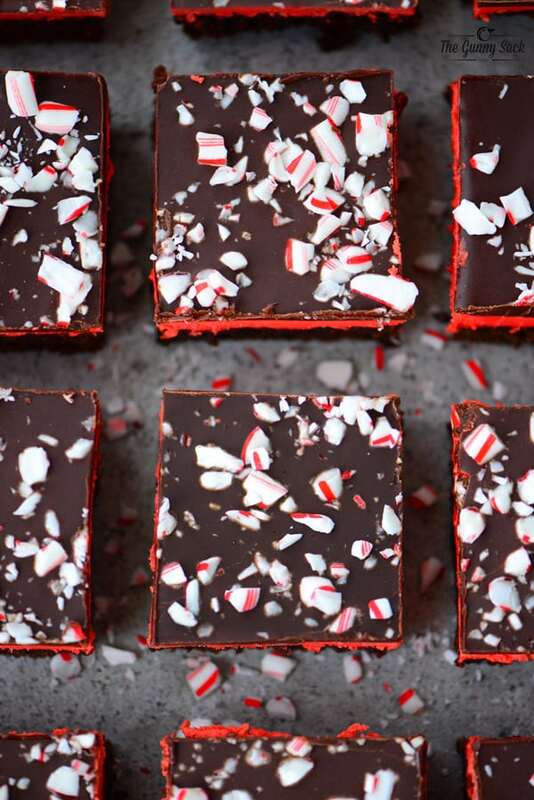 My whole family loves chocolate and mint so we picked a night recently to make these Chocolate Peppermint Brownies and had such a nice evening together. 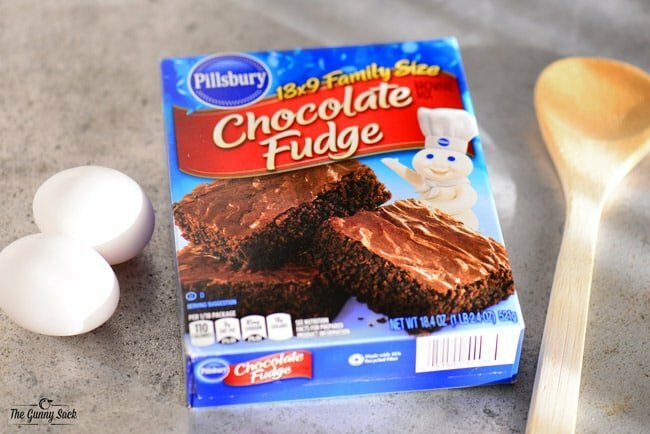 Step 2: Using convenient, delicious Pillsbury™ Baking and Frosting Mixes, whip up a fabulous treat as a family. Step 3: Have fun and document the experience! I love this challenge because kids of all ages like baking and there are always steps they can help with. The older they are, the more they can do to help. You can embrace your inner Doughboy and enjoy time with your family all at once. 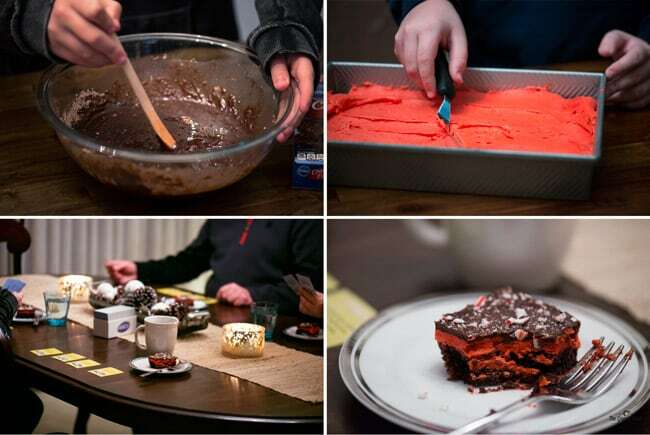 We used the Pillsbury Chocolate Fudge Brownie Mix to make these Chocolate Peppermint Brownies. Vanessa made the brownies, I made the frosting and Zack frosted the brownies. Then, we all sat down at the dining room table and played a game while enjoying our brownies. We laughed and joked and had fun together. It was a nice break in the middle of the week and something we need to do more often. 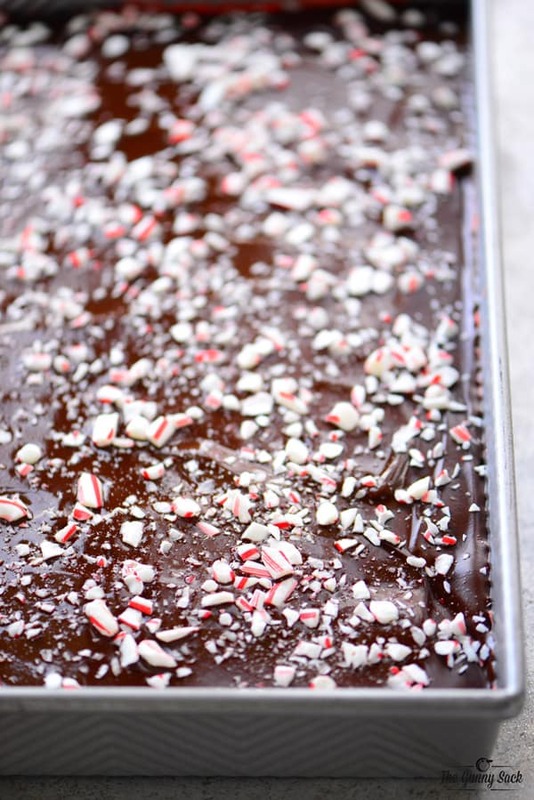 To make these Chocolate Peppermint Brownies, pour the brownie mix into a large bowl. Add oil, cooled coffee (or water), and eggs. Stir 50 strokes with a spoon, spread in a greased 9×13-inch pan and bake at 350° for 28-31 minutes. Remove from the oven and cool completely. For the peppermint buttercream frosting, beat the softened butter for two minutes, until light and fluffy. Add the sugar, milk, and peppermint extract. Stir until combined, then beat until smooth. Stir in red food coloring until it is the shade you want. Spread the frosting over the cooled brownies. Place in the fridge so the buttercream can chill and harden. Heat the chocolate chips, butter, and light corn syrup in the microwave at 50% power for 2 minutes and then stir. Continue heating at half power, stirring ever 15 seconds until smooth. Stir in the peppermint extract. 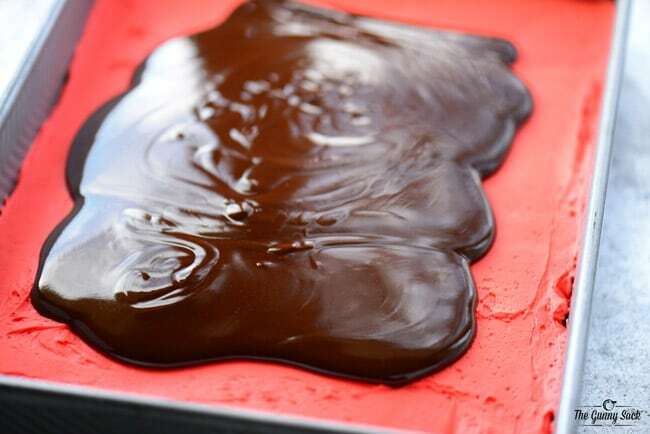 Pour the chocolate peppermint icing over the hardened frosting and quickly spread it out. Immediately sprinkle with chopped candy canes, before the icing hardens. Then, return the bars to the fridge so the chocolate can set. Once chilled, cut the brownies into squares. It helps to heat a knife under hot water, wipe dry and then use the hot knife to easily slice through the chilled layers. 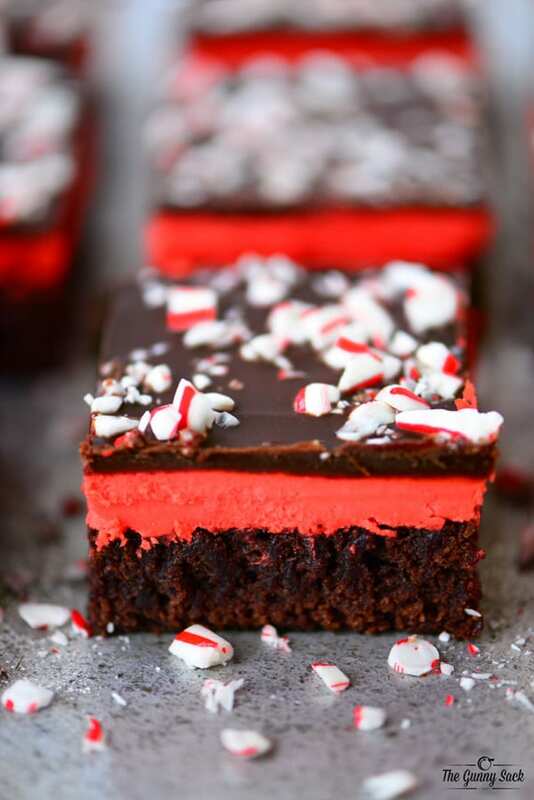 The combination of fudgy brownies, peppermint buttercream, and chocolate icing of these Chocolate Peppermint Brownies is irresistible! It’s something my whole family can agree on and these bars were the perfect thing to make for out technology-free evening. 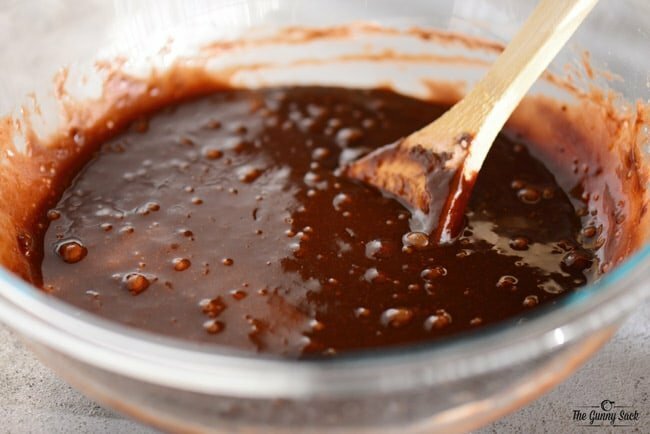 Pour the brownie mix into a large bowl. Add oil, cooled coffee (or water), and eggs. 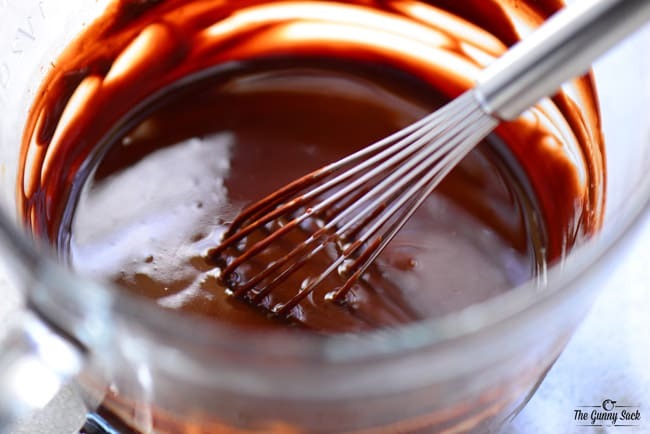 Stir 50 strokes with a spoon, spread in a greased 9×13-inch pan and bake at 350° for 28-31 minutes. Remove from the oven and cool completely. Beat the softened butter for two minutes, until light and fluffy. Add the sugar, milk, and peppermint extract. Stir until combined, then beat until smooth. Stir in red food coloring until it is the shade you want. Spread the frosting over the cooled brownies. Place in the fridge so the buttercream can chill and harden. Heat the chocolate chips, butter, and light corn syrup in the microwave at 50% power for 2 minutes and then stir. Continue heating at half power, stirring ever 15 seconds until smooth. Stir in the peppermint extract. 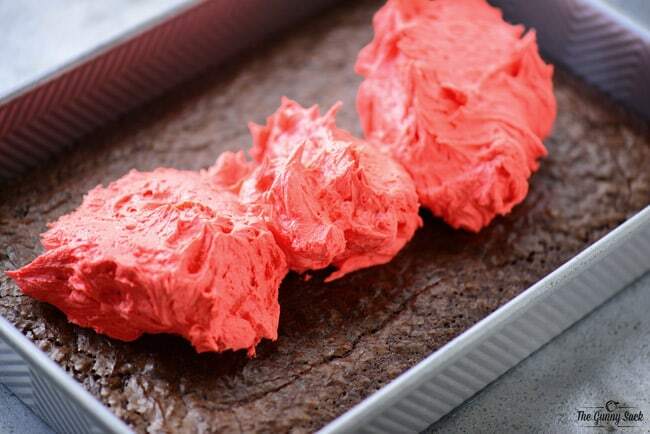 Pour the chocolate peppermint icing over the hardened frosting and quickly spread it out. Immediately sprinkle with chopped candy canes, before the icing hardens. Then, return the bars to the fridge so the chocolate can set. Once chilled, cut the brownies into squares. It helps to heat a knife under hot water, wipe dry and then use the hot knife to easily slice through the chilled layers. Store in the fridge. I love all of the layers that go into these beautiful brownies! You did a fabulous job! I’m not a huge fan of peppermint on my sweets, but that peppermint buttercream has convinced me to try them! How wonderful and festive!